A top ten class finish was cruelly snatched from Team RLR in the final round of the 2010 Le Mans Series at Silverstone today (September 12), as a mechanical failure just 15 minutes from the end of the 1000km race denied the Lancashire-based squad a confidence-boosting end to the season. Having elected to contest the final two rounds of the championship at the Hungaroring and Silverstone the newcomers were looking to gather as much experience in the MG Lola EX265 as possible before taking on a full campaign in 2011. With one box ticked after finishing eighth in class in Hungary, Team RLR sought a similar result at the home of British motorsport to help push forward the development of the squad. However, after 141 drama-filled laps the LMP2 challengers were brought to a shuddering halt - with a suspected drive shaft problem putting paid to their hopes while sitting ninth in class and 21st overall of 45 starters. The weekend had started well for the new kids on the block, showing good pace in free practice and Rob Garofall then placing the MG Lola 9th in class & 20th overall on the grid after qualifying despite changeable conditions that made the track swing between dry and wet. Sunny weather arrived in time for the start of the five hour race though, and Barry Gates made a great start for Team RLR in the opening laps. He picked off two class rivals, and was rapidly closing on those ahead of him, before an off resulted in a pit stop to tidy up the car and dropped the MG Lola back to 36th overall. Once Gates returned to the fray he had made steady progress though, and by the time he handed over debutant Simon Phillips almost two hours in, Team RLR was on the comeback trail. Phillips settled quickly to the task in hand and drove a very clean stint to recover some of the ground lost earlier in the day. With no major dramas and his lap times consistently improving throughout, the London-based driver had moved up to 33rd overall before handing over to team-mate Rob Garofall. The Leighton Buzzard man used all of his seven years experience as an instructor at Silverstone to quickly make inroads into the field ahead of him, and four hours into the race Team RLR was up to ninth in class and 24th overall. As the speed of rival cars began to wane going into the final hour of the race Garofall was on a mission, recording Team RLR’s quickest times so far and consistently upping the ante. Even a quick pit stop to fit a new nose to the MG Lola, as a result of some minor damage to the front end bodywork earlier in the race, didn’t halt Team RLR’s momentum much. However, shortly after a much bigger problem did. Garofall was powering out of a corner when a suspected driveshaft failure brought him to a stop and the fight was over for Team RLR only minutes from the end of the race. Despite the bitter blow so close to the finishing line the Team RLR line-up was buoyed by the fact it had once again shown its intention to compete at the very top level and build towards becoming a strong presence in the Le Mans Series in seasons to come. 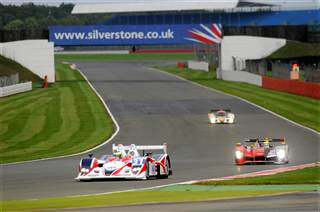 For high resolution digital photographs, please visit the Silverstone Gallery.